14.1 - Ogtay Sadigzade - Targeting the Arts - Son of an "Enemy of the People"
Son of an "Enemy of the People"
Ogtay Sadigzade (born 1921), distinguished portrait artist, is one of very few Azerbaijanis who are still alive today who survived imprisonment in Stalin's Gulag labor camps. In 1941, at the age of 20, he was exiled to South Central Russia for five years. His only crime: being the son of an "Enemy of the People". But he wasn't the only member of his family to suffer. His father Seyid Husein, a writer and member of Azerbaijan's intelligentsia, was executed in 1938. His mother Ummugulsum was exiled for 7.5 years (1938-1945) and returned home so weak that she died shortly afterwards. His brother Jighatay was sent into exile as a battalion worker to Dagestan. He got tuberculosis and also we sent home where he soon died at the age of 24. Here Ogtay reflects on some of his experiences and how it shaped his thought and art. See other articles in this issue related to his mother Ummugulsum, which include several entries of her prison diary, her poems, and letters to her children. I was born in 1921 in Khizi, a village near Baku. My father and mother, Seyid Husein (1887-1938) and Ummugulsum (1900-1944) had just married when the Bolsheviks took control of Azerbaijan's capital in April 1920. Since Father was a close relative of Mammad Amin Rasulzade (Mammad Amin Rasulzade was the leader of the Musavat Party, which established the Azerbaijan Democratic Republic (ADR) in May 28, 1918. The ADR collapsed after 23 months when the Bolsheviks took power in Baku on April 28, 1920) who led the Musavat Party which was in power when the Bolsheviks came, he feared for his life and took mother and went into hiding in Khizi. Three months later, father returned to Baku only to be arrested by the NKVD (NKVD: (from Russian) Narodniy Komitet Vnutrennix Del, which means National Committee for Internal Affairs. The NKVD became the forerunner of the secret police agency of the KGB). They held him for two months. It was the first of three times that he was arrested. When he was arrested for the third time in 1937, I was 16 years old. Actually, I wasn't home when it happened. I was in Novkhani, one of Baku's suburbs at the "bagh" (Azeri for "summer house") of Mammad Amin Rasulzade. They had just arrested Rasulzade's son, Rasul, there. He was only 18 years old. So I returned to the city to tell my family. Father was at our summer house in Shuvalan, another suburb by the sea. At the time, he was 50 years old. They said that they were taking him to some meeting. My sister Gumral was five years old at the time but she remembers that our brother Toghrul asked Father when he would return. "The day after tomorrow", he had replied. At first they believed him. Mother wasn't at home at the time. My aunt, who was there with the children, started to cry and said that he would never come back. She was right. Left: Ogtay's classmates in fifth grade, 1932. Clockwise (standing from left): Ogtay Sadigzade, Hajiagha Hasanzade, Aghareza Hasanzade, Habib Habibzade and Ali Ahmadov. I never saw my father again. Two years later they told us that father had been given a 10-year sentence but it wasn't true. It seems they had already shot him, almost immediately after they arrested him although we never learned the specific circumstances around his death. In 1943 after the war had started, one of our family members wrote a letter in Gumral's name to the NKVD and then they called her there. She was only in third grade at that time. They asked her what she wanted. "Where's my father?" she asked. They told her that she would get a letter from him after 1948. Imagine, telling you to wait for five years before you would hear from your father. What could we do but wait? But the letter never came. It wasn't until 1956 that we received his rehabilitation papers. There they had written that he "died" on February 6, 1938, not that he had been "executed". I couldn't believe my father had been arrested. I thought there must be some misunderstanding because he had never committed a crime. He was a writer, critic, publicist, and educationist - not a criminal. Not an "Enemy of the People," as they claimed. But this was only the beginning of series of executions of Azerbaijan's intelligentsia. Later on, they arrested other major literary figures such as Mikayil Mushfig, Ahmad Javad, Husein Javid, Boyukagha Nazarli and Taghi Shahbazi. And then four months later, they came after mother. We were afraid that might happen as the agents had already come for some of the wives of other prominent writers. So we made plans that my aunt, Mammad Amin's wife, would come and stay with us in case mother was taken. That way we four children wouldn't be left alone. But before we could arrange anything, the NKVD arrested my aunt and exiled her along with her entire family to Kazakhstan. It was about midnight when the agents came for mother. Again I was in shock. The state wanted to put us in an orphanage, but Sayyara, our cousin, wouldn't let them. She came and took care of us. She was 22 years old, only five years older than me, the oldest child. Suddenly, her life was turned upside down and she had the responsibility of taking care of us four children, ages five to 16. Actually, even though Sayyara was our cousin, my family had adopted her several years earlier because they wanted a daughter, and Gumral had not yet been born. Left: Portraits of some of Azerbaijan's well-known writers who were executed by Stalin. Clockwise from bottom center: Prisoner No. 1113: Husein Javid (1882-1941); No. 1286: Seyid Husein, the artist's father (1887-1937); No. 11?? : Mikayil Mushfig (1908-1937); No. 2369: Idris Akhundzade (dates unknown); No. 2109: Abbas Mirza Sharifzade (1893-1938); No. 1280: Panah Gasimov (1881-1939); No. 169. Yusif Vazir Chamanzaminly (1887-1943); and No. 1112: Ahmad Javad (1892-1937). Portrait oil painting by Ogtay Sadigzade. Ogtay and his mother Ummugulsum together spent 13 years in exile in prison camps. Ogtay's father Seyid Husein was executed. This painting is on display at the Husein Javid Home Museum, inside Baku's Institute of Manuscripts. So Sayyara knew us well as she had lived with us as a member of the family. She felt that it was her duty to take care of us. Under normal circumstances, she would have married and started her own family during those years. She missed that chance and didn't marry until she was in her 60s. She did her best for us and tried to comfort my mother in prison and exile, promising her that she would never leave us. What could she do? We have always been eternally grateful to Sayyara for dedicating herself to us in those difficult years. After they took mother, I only saw her again - but just once. They kept her in Bayil prison for a while. After several months, she had visitation rights so we were able to go and visit her one time for half an hour. I think it was in May. We waited outside the prison for such a long time. There were so many people. I remember the terrible stench. The smell was so bad. We met with mother in the corridor. It was such a difficult moment for us children and for her as well. Gumral, my little sister, was only five years old. Mother couldn't recognize her because she had lost so much weight. Of course, mother told us not to worry about her and that she was fine. We also told that we were fine. None of us could say what we really felt. How could we? What could we do for each other when our hearts were so heavy? And later when we wrote each other, it was much the same. We wrote about general things. The letters were censored so we couldn't write much. Naturally, we didn't want to worry each other. I was very young back then - really just a child. We all kept thinking that everything would be better soon. And then in 1941, I myself was exiled as a son of an "Enemy of the People". It would be five years before I returned home; but by then, mother had already died at home in 1944. Actually, my family didn't tell me about mother's death. It's a practice in this part of the world not to disclose about someone's death when you are alone and far away from your family. When I returned from exile, I looked forward to seeing her. My family had kept it a secret from me that she had died. I kept writing letters to her, not knowing that she had already passed away. Mother's death was the worst thing that ever happened in my life. Nothing can be compared to the devastation that I felt when I returned home from exile to find that only my younger brother Toghrul and sister Gumral were all I had left. My father, mother and brother were all dead. Actually, when they came for me, it wasn't an arrest in the usual sense of the word. World War II officially started for us in the Soviet Union on June 21, 1941. On June 9, the NKVD [forerunner of KGB] came for me. I was 20 years old at the time. I received a notice to go to the army. I didn't go to the military office; they came for me the next day. I was working at the Nizami Museum of Literature at that time, showing some of my work. They came and took me right in the middle of my evaluation - right in the middle of the day. They told me that they were taking me to the military service but I soon learned that they were shipping me out to a hard labor camp. I was the son of an "Enemy of the People". It didn't matter that they had already killed my father and that they had already sent my mother to exile in Central Asia. Left: This is a "zemlyanka - the barracks for prisoners where Ogtay Sadigzade used to live while in exile in Altai, in the North Arctic region. The buildings were built three feet underground for warmth. Sketch by Ogtay Sadigzade, made especially for this interview. Ogtay was exiled there for five years. The conditions were so bad that he and some friends begged to go to the war front, but were not allowed because they were "political prisoners". They took me along with others for a month and a half of military training. Then the war started and everything changed. The Germans who were living in the Caucasus around Shamkir and Khanlar in Azerbaijan were exiled to Altay along with us. Later they were separated from our group. For the first three months, we stayed in Nasosniy Station near Sumgayit, not far from Baku. We helped to build a military airport runway. We had a difficult time. The food was adequate but the working conditions were terrible. There was no shade. We had to work all day under the blazing sun. Our job was to crush stone and mix it with cement. We used to work 18 hours a day - from the dawn to dusk. After that, they sent us to Georgia, to Kabuleti near Batumi for three months (September to November 1941). There we built trenches so that tanks couldn't pass. At the end of November, they sent us to Sochi [Georgia]. Again, we were assigned to digging trenches. 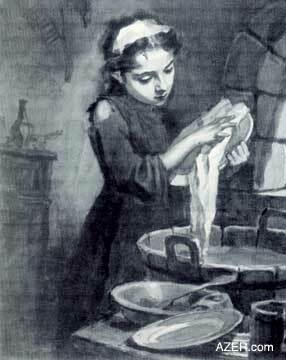 Left: "Cosetta", an Illustration for Victor Hugo's "Les Miserables" by Ogtay Sadigzade (1963). On exhibit at the Azerbaijan State Museum of Art. Then we returned to the port of Baku, but I didn't have a chance to stop by home to see my family. Little did I know that I would never see my mother again. They shipped us out from there. We had no idea where they were taking us. There were 5,000 of us on board that ship. There was no place for so many people, so I was among those who had to stay on deck in the midst of a snowstorm. For the first time in my life, I could hardly keep myself from crying. We had no idea where we were going or when we would be back, or even whether we would be coming back at all. The ship left Baku at night and arrived in Krasnovodsk (Today this city is called Turkmenbashi. It is located on the Krasnovodsk Gulf of the Caspian Sea, and its population is primarily ethnic Russian and Azeri - Wikipedia: April 25, 2006) the next morning. Then we were put on a train. Again I didn't know where we were going. We were headed for the Garagum desert (The Karakum Desert, also spelled Kara-Kum and Gara Gum ("Black Sand") is a desert in Central Asia). Six or seven hours later, the train stopped at the station. When I got out, I realized that there was no end to the train. It was very long. Maybe, more than 1,000 people. Each wagon carried about 30-35 people. They had built two levels of shelves in each of the wagons. That's where we slept. On our train, it was only men - young men from all over the Soviet countries - Azerbaijanis, Armenians, Georgians, and there were also Bulgarians, Hungarians and even some Greeks. There were only a few Russians. Eventually, we reached Tashkent (Tashkent is the current capital of Uzbekistan). They let us bathe there. I wish they hadn't. After leaving the bathhouse, I realized that I was full of lice. It seems all the clothes were piled together and that's how my clothes got infected. It was a situation which plagued me for four years. I never could get rid of the lice. Finally, we arrived in Rubsovsk, a provincial city in the Altay region (Altay region is in South Central Russia) of South Central Russia. When the war started , the government had intended to build a military plant here for producing tanks. But when the war started tapering off, they decided to convert the factory into manufacturing tractors instead. Everyone who had been exiled to Rubsovsk took part in the construction of that plant. 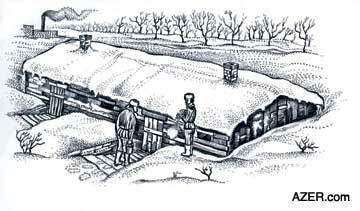 We lived under very difficult conditions in "zemlyankas" (Russian, for "underground huts"). These barracks were mostly dug out underground. They were about three meters high and housed 250 people. The walls were wooden, the floor was mud. There were only two small windows. There was no heater and no electricity. We used oil lamps. In the mornings, we would wake up to find the walls inside covered with frost. The only telephone in town was at the post office. As it was wartime, our greatest problem was lack of food. We stayed hungry all the time. I constantly craved bread. Hunger has a way of changing a person psychologically. When you're hungry, you can think of nothing except food. You forget about all the greater goals and principles that you have been taught. You are consumed with only one thought - food. And even when we had enough food, even when our stomachs were full, we were never satisfied. They used to feed us potato skins. The actual potato itself was sent to soldiers on the frontline. They used to make mashed potato skins for us or baked pudding (he laughs). We had bread, too. But what bread! It was impossible to eat. It looked more like mud and tasted very sour. I have no idea what it was made of. It was like glue. Sometimes, there was no choice but to eat it, and I would get heartburn. The Soviets would ration the bread: 800 grams forgood workers who exceeded their quota, 500 grams for those who met their quota, and only 300 grams if you didn't work. Usually, we were given nothing more than bread. I got into the habit of economizing. 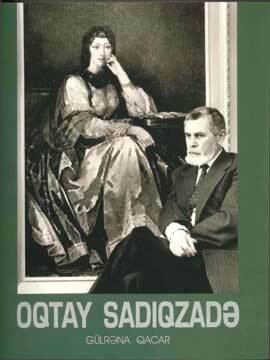 Right: Collection of Ogtay Sadigzade's works. Text by Gulrana Gajar. 1984. I would save a portion of bread from the morning for dinner in the evening. In addition to bread, sometimes there was kasha [plain boiled wheat]. But it doesn't take long to break the habit of eating kasha [meaning it's not very tasty]. We were always hungry. Let me tell you a story about food. One day when I was returning from work to the zemlyanka, I saw a Moldavian carrying some sugar beets. He told me that about four to five kilometers from the city there was a field of sugar beets. They used to harvest them by digging them up and spreading them out on the ground during cold weather. That would cause them to sweeten. So one night, my friend and I took some sacks and went in search of the sugar beets. It was the end of November. As we were going, a strong wind blew up - they call such winds "buran" (in Russian, it means "snowstorm" or "blizzard"). Those winds are so violent that you can barely stand up against them. They hit you in the face and you can barely see anything. After a long search, we finally located them. It was just a field but there were sugar beets as far as you could see. We gathered as many as we could - four sacks full. Then it got dark. As it was desert and there were absolutely no landmarks, we didn't know in which direction to start walking back. We walked for a long time. Despite how windy and cold it was, we were sweating. Then we started to get really worried that we might be lost and we would freeze to death. Then an idea crossed my mind. When we had headed out in search of the field, the wind had been beating us from behind. Now that we were returning, it was still behind us. So we figured we were heading in the exact opposite direction that we should be. We were so exhausted by the time we arrived back at the zemlyanka early in the morning. I couldn't take a step further. But the sugar beets saved us that winter. We would go and collect them there from the desert. When you cook them, they taste much like pumpkin: they're very sweet. Because of their high caloric value, they saved us from starving. We continued to collect them for a year and a half more. After that, they placed a guard there in the field and we were afraid. Severe hunger continued until 1943. Towards the end of that year, America supplied us with dried eggs, sugar cubes and other products. Clothing was also a problem. Because of the war, there was a shortage of everything. We were given only trousers and a "telogreyka" [Russian, meaning "body heater", meaning a thick cotton-padded jacket]. Fortunately, the cotton padding did quite a good job of staving off the cold. We wore it both in summer and winter. Our shoes were made of thick felt. It kept our feet warm, but whenever they got wet in winter, you were in real trouble. Your feet would freeze. The climate was continental: very hot in summer and very cold in winter. Then in 1943, some aid came from America - some second hand clothes and boots. I got a pair of boots and warm underwear. That was good. Bathing was also a problem. There was only one bathhouse in the entire city. To bathe, we had to sign up in advance and go there as a group. Can you imagine, we only got to bathe once every three or four months. I remember that once our turn came at three o'clock in the morning. And so we walked there - about three kilometers distance. It was so cold, like -43 degrees Celsius [-45 degrees Fahrenheit]. They used to try to sanitize our clothes against lice. They would steam our clothes under high pressure. Sometimes they didn't have enough pressure and our clothes would get soaked. We would return to our barracks wearing wet clothes under our coats in such extreme cold weather. Most people got sick. Even some of the strong guys did. I'm surprised that I didn't because I've never been especially strong. There were no doctors. At 6 o'clock, we had to wake up. Our work place was three kilometers distance from the barracks. We had to be at work at 8 o'clock. We would walk there; it would still be dark outside. Then we would have lunch in the cafeteria at 12 noon. We would return again for dinner at 7 o'clock at the same cafeteria after work. We used to work 10 hours a day without a single day or weekend off. There were no breaks until 1944. In the beginning I had been involved at the factory digging the hard ground, preparing the foundations of the building. I had grown up as a "house kid". My parents had not allowed me go outside much to play in the streets and alleys. After all, keep in mind that it was in the early 1920s and life was quite brutal and tumultuous back then. Physically, I wasn't very strong. When I started working in the labor camp and assigned to digging the ground, it was really hard for me. I couldn't even hold a shovel. It was so hard to dig into that frozen ground. Gradually, I got used to it. Those years Altai witnessed some of the coldest temperatures in their history. The temperatures would go down to -43C (-45F). It was extremely cold even for them. After a while, I succeeded in finding another job. As I am an artist, they were eager for me to work in that capacity. The Soviet government could not live without painters. Their propaganda was being carried out with the help of artists. There's no doubt in my mind that art saved my life. After I started my new job, my living conditions were very different. They even gave me a studio. My job was to draw portraits of the leaders, make posters, and political cartoons. It sure was a lot easier than digging. Besides, I liked it. Once I was commissioned to draw 40 different portraits of Stalin. I had no other choice but to do it; otherwise, they would have sent me to the military tribunal. Those were the days that if you dared to slightly criticize Stalin, you could land in trouble. I became so professional in drawing portraits of Stalin that I could sketch him very quickly. I wasn't trying to express anything about his personality. It just had to look like Stalin. For me, it was like drawing a still life or a landscape, like drawing from a template. We didn't have any paint so we could only use two colors - red and black-red from women's lipstick and black from mascara. I had studied art at the art school in Baku named after Azim Azimzade (Azim Azimzade was one of Azerbaijan's first professional artists. He was famous for satirical sketches that exposed social conditions, especially the wide gap that existed between the rich and poor at the beginning of the 20th century) and then I was sent into exile so I never got the chance to complete my studies in Moscow or Leningrad. After I returned home from exile, my family's financial situation prevented me from continuing my education. Although I have received many titles and commissions, I never received higher education. The aim of my whole life has always been art. I never wanted to be anything except an artist since I was a kid. The five years that I lived in exile was a tremendous education for me in art. My experiences in exile had a profound affect on the way my art developed. Such experiences leave deep imprints even if one isn't conscious of them, both enriching the human being psychologically and broadening one's world vision. The artist needs to see many things. The more he sees and experiences, the more his creativity develops, especially portrait artists. Human characters have always interested me. Perhaps, I should have been a psychologist, instead of an artist. In the camps you got to know so many different types of people - both good and bad. I met thousands of people in exile. Everyone had a different character, and everyone came from a different world, a different reality. To be a portrait artist, you have to be able to reveal the inner personality of a person. The eyes, the movements of lips, shape of the face - they all reveal the true inner nature of a person. In addition to life in exile, I would say that my art developed because of just plain hard work. Painting requires a lot of persistence and determination. You have to work like a dog. It's 10 percent talent and 90 percent hard work. Nothing is possible without hard work. Museums and classical books also shaped my art. If you want a professional education in art, you have to read a lot. An artist has to know something about everything. I read so many of the Western classics while I was in exile; for example, Dickens, Shakespeare, Balzac, Victor Hugo, and even some of the American writers. They had a library in the camp and I read everything I could get my hands on. Later I had the chance to visit a number of European countries. There I visited many museums. Only later in 1944 did they allow us to rent rooms in some of the private apartments in town. That's when I began to work as an artist and my living conditions started to improve. "Stalin's repressions (1920s to 1950s) were such an absurd period in our history - not just in Azerbaijan, but the entire Soviet Union. The atrocities that were committed can't even be compared to Hitler's. They were much worse. Hitler went after his political enemies, but Stalin destroyed his very own intelligentsia - the strength of his nation." who had been falsely accused of being an "Enemy of the People"
I rented a room in the home of a woman, who lived with her daughter-in-law and two grandchildren. For the rent, they preferred wood to heat the place, not cash. To find wood was such a major problem for them. At first when we arrived in Rubsovsk, the people were very suspicious of us. They called us "Chyorniy Boyets" (Russian for "Black Warriors") because we were dressed in black. The local population consisted mainly of women and children, as all of the men had been sent off to war. After the camp authorities allowed us to live in separate private houses, the attitude in the community towards us totally changed and they grew to respect us. When they got to know us personally, they realized that we weren't bad people. They even tried to help us-most of us were Azerbaijani, but there were Georgians, Armenians and prisoners from other nations as well. 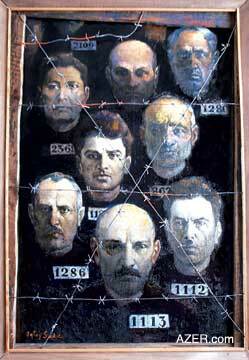 About 25-30 percent of the prisoners were former criminals - some of them had committed serious crimes. The government sent many of these "criminal prisoners" to the front, but not ones like me, which they categorized as "political prisoners". They considered us to be dangerous. We begged to be sent to the war front rather than live the horrible life in the camps. There was a commission to review every person's history but those who had a parent whom they considered to be an "Enemy of the People" were never sent to the war. They didn't trust us. When it came to language, actually, Azeri was like an international language there. There were so many Turkic-speaking people-Ajars (Ajaria (also known as Ajara, Adjaria, Adjara, Adzharia and Adzhara) is an Autonomous Republic of Georgia, in the southwestern corner of the country, bordered by Turkey to the south and the eastern end of the Black Sea - Wikipedia: March 30, 2006), Bessarabia (Bessarabia or Bessarabiya (Basarabia in Romanian, Besarabya in Turkish) was the name by which Imperial Russia designated the eastern part of the principality of Moldavia annexed by Russia in 1812. In 1918, Bessarabia declared its independence from Russia and at the end of World War I, it united with the Kingdom of Romania. The USSR annexed Bessarabia at the beginning of World War II - Wikipedia: March 30, 2006), Tatars (Tatars is a collective name applied to the Turkic people of Eastern Europe and Central Asia. Before the 1920s, Russians used the name Tatar to designate numerous peoples from the Azerbaijani Turks to tribes of the Siberia. Tatars live in the central and southern parts of Russia (the majority in Tatarstan), Ukraine, Poland and in Bulgaria, China, Kazakhstan, Romania, Turkey and Uzbekistan. They collectively numbered more than 10 million in the late 20th century - Wikipedia, March 30, 2006) and Turkmen (Turkmen is a name currently applied to two groups of Turkic peoples. The ending of the name has no relation to the English words "man" or "men". Historically, all of the Western or Oghuz Turks have been called Türkmen or Turkoman, but nowadays the term is usually restricted to two Western Turkic groups: the Turkmen people of Turkmenistan and adjacent parts of Central Asia, and the Turkmen people of northern Iraq - Wikipedia, March 30, 2006). 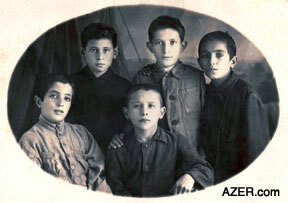 Most of the Armenians could also speak Azeri, as did Georgians. Of course, the local people spoke Russian, and it was in exile that I learned Russian. I did write letters to my family but most of them have been lost. The government didn't put any restrictions on how many letters we could write. We could write as often as we wanted, but we had to write in Russian; otherwise, the chances were slim that the letters would get through. After all, they were censored. It used to take about two months for letters to reach their destinations. Those last three or four years when I was in exile, I used to keep a diary, but I can't find it. I think it must be lost somewhere in our place in Ichari Shahar [Old City] where my niece lives now. It's very important that the new generation realizes how difficult it was back then. Only when you compare life today with life back can you realize how easy it is now. I'm not saying that there aren't a lot of difficulties today, but comparatively speaking, it's much better now. People had so many problems during Soviet period. Everything was a problem. So many things were not available. One day you couldn't find meat. The next day, no sugar. We should appreciate our life now no matter what problems we have to deal with at the moment. The Soviet system was a fraudulent system. Everything was based on lies. Although our country has a lot of problems at the moment I am hopeful that these problems will be solved in the near future. There is still corruption and bribes, and nobody is taking measures to prevent this. Financially, we are living better now than during Soviet times. But there are still problems. Corruption should be stopped. Excuse my language, but Stalin is the worst rascal of all. The interesting point is that millions of people were so blind and didn't realize it. People were like sheep. They believed in him; they thought he was God. For example, my cousin Husniyya had so much faith in him even though her family suffered so much. When he died in 1953, she went crazy. She couldn't believe that God could die. She went psycho. The world turned upside down for her. She was nearly 50 years old at that time. Husniyya could not believe what they said about Stalin after his death. She was totally lost and didn't know what to do for about two years. So many people in my family suffered because of Stalin. My father was killed, and my mother was arrested, my brother died in exile, cousins were arrested and killed, my aunt's family and my uncle's family were sent into exile, but still Husniyya was convinced that these people were truly guilty. No one was able to stop Stalin from doing all these evil things because his organization was so strong. Nobody could counter him. Ninety percent of those millions of people who were arrested were totally innocent. There was no reason to arrest them. But nobody dared to say anything because everything - the army, guns, and power - were in his hands. The system was based on denouncing others and spying on them. The system was so false; it had to collapse in on itself - to implode. And that's exactly what happened. The system rotted from inside. But Mir Jafar Baghirov (Mir Jafar Baghirov was the First Secretary of the Communist Party in Azerbaijan; in other words, "Stalin's right hand man" in Azerbaijan) was even worse; he was a vile person. At least Stalin had some principles; Mir Jafar did not. He did things to oblige and please Stalin. A few years ago, a film was made about Mir Jafar. It was a rather amateurish thing. To tell you the truth, I didn't like it very much. Several people were interviewed: some people criticized him, while others praised him, insisting that he had many positive sides. But it's not right to call him a good person just because he gave some people apartments. In the end, they showed footage of Baghirov's trial that took place after Stalin's death. However, in general, the film depicts Mir Jafar as a hero at the trial. He admitted to making mistakes and said Armenians had deceived him but, in my opinion, he was a totally corrupt person. The film tries to show that Stalin wanted to deport all Azerbaijanis to Central Asia, and that Mir Jafar persuaded him not to do it. But consider how difficult it would have been to deport four million people. Stalin would have had to recall half a million soldiers from the army just to guard such a mass deportation. Furthermore, where are the documents to prove such a deportation? It's so important that our young people should feel responsible to their own people and to the nation. The state is based upon education, the army and the tax system. Without them, the state could fall apart. These things are not strong in our country; the youth should not be under any delusions. They should be conscious and alert, and able to distinguish between what is good and what is bad. Stalin's repressions (1920s to 1950s) were such an absurd period in our history - not just in Azerbaijan, but the entire Soviet Union. The atrocities that were carried out can't even be compared to Hitler's. They were a lot worse. Hitler went after his political enemies, but Stalin destroyed his own intelligentsia. It's impossible to compare Azerbaijan's intelligentsia of 1930s and 1960s with the present day. We have declined in every sphere. For us to reverse this trend would probably take at least two generations. The problem is we don't have good teachers. To create an intelligentsia, you need good teachers and you need to create an environment in which intellectuals can flourish. At present, these conditions don't exist: we neither have such teachers as models, nor the cultural milieu to nurture and foster them.